Even though I have lots of minor news stories to report when I have time, there's no Sengoku Basara at all in my purchases today! Instead there's a heap of cuter items spanning two photographs. The first is more varied. Both Rose of Versailles DVD sets arrived together after their long journey from the US. I already had the Italian DVDs but Nozomi's are much nicer and contain English subtitles. Below them are the two beautiful double-sided pencilboards that were given away to customers who purchased directly from TRSI. 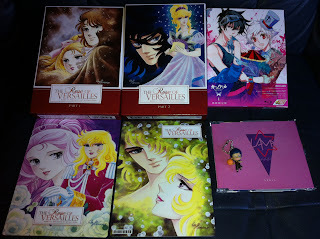 Rose of Versailles is one of my favourite anime series. It's so exciting to be able to own a decent copy after all this time. The second picture is rather one-sided. I'm rapidly reaching the end of the Zettai Karen Children anime and the next step is naturally to begin reading the original manga. After getting it into my head that I'd be able to pick most of the series up as a bundle, I headed into central London last week to visit Adanami Shobou, a Japanese used bookstore which masquerades as a run-down laundry shop. Miraculously, they had a single bundle on sale containing the first 24 volumes of the series. Hurrah! This fit in perfectly with my existing CD Japan order for the limited editions of volumes 26 (containing a drama CD) and 28 (containing a Hyoubu Kyousuke 'figure' strap). The latter of the two fetches a vastly inflated price on Amazon Japan by now. The strap is right at the bottom of the picture resting on its box. The limited edition set also included a foldable diorama so you can dangle Hyoubu in front of his P.A.N.D.R.A. allies. A matching 'The Unlimited' version of the strap is coming out soon for double the fun. 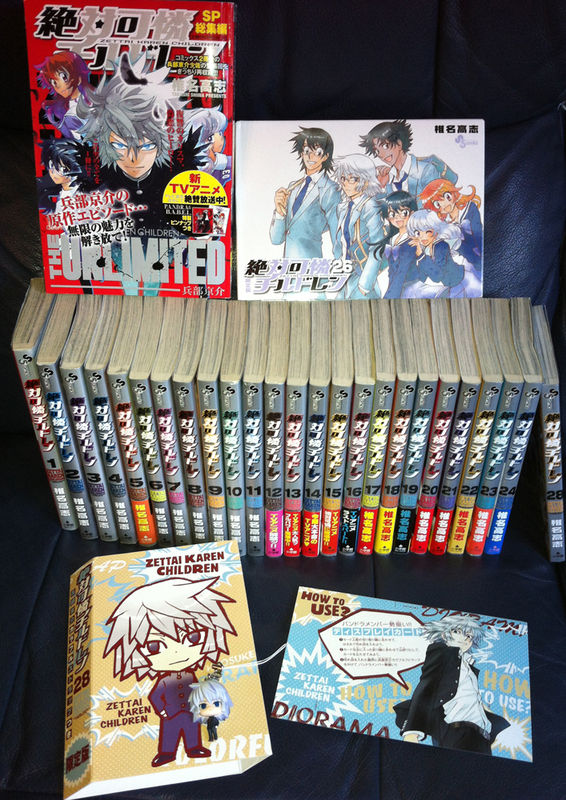 Last but not least is a compilation book, Zettai Karen Children: The Unlimited -Hyoubu Kyousuke- Best Selection. It's a mini 'phone book' manga which collects stories about Hyoubu Kyousuke along with a small double-sided poster. Though there's very little (if any) new content inside this volume, it's handy to have if you ever need an intensive dose of the series' best character without rummaging through the rest of the manga.